Triumph Motor Cycle Transmission/Gearbox, suitable for use on Pre Unit 650cc and 500cc Models 1958-1962. Complete assembly, spins freely, being sold for parts or as a core to rebuild. Case has been repaired and strengthened around the to mount, spins albeit with resistance. Good condition. Ideal for the Speed Twin, Tiger 100 and 3T De Luxe. 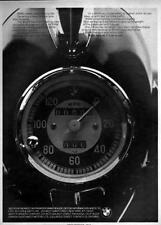 1960 Original Triumph Motorcycles sales brochure folder. Pre Unit BSA Motor Cycle Outer Transmission Inner Cover. Suitable for use on A and B Range Twins and Singles. Unsure of actual application. Will need straitening. Suitable for use on Pre Unit and Unit Twins with a 1" Handlebar ORor a 7/8 Bar with the appropriate shims including the Tiger 100, Speed Twin, Thunderbird, Trophy TR6 and TR5, Bonneville T120C, TT Special, T100C amongst others. 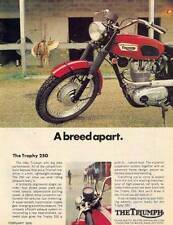 1967 type as fitted to British Motorcycles including Triumph, BSA and Norton Commando Models. The Lucas Continental Reflector has the pilot light as well as an area of scuffing. Old style "Fast by Ferracci" Ducati Team Corse USA. onehigh quality vinyl sticker. Triumph Bonneville TT Special. The images below are illustrative only - Are not in proportion to each other and have been given a drop shadow for effect. Now available to everyone - Even people who manage to splatter sauce eveywhere when they eat spaghetti. Triumph 650cc Motor Cycle Twin Cylinder Unit Crankshaft. In good used condition, it seems that loctite was not enough for this builder, he has welded the 3 Crank Bolts. Suitable for use on Unit 650cc Twins including the TR6 Trophy, 6T Thunderbird and T120 Bonneville. Genuine Triumph Motor Cycle Outer Transmission Inner Cover, part number T1219 Suitable for use on 500cc and 650cc Pre Unit Twin Cylinder models 1954-1959 including the TR5, TR6, Speed Twin, Tiger 100 and Thunderbird. This applies to letters weighing more than 1 kilogram. Story book, hardcover, 400 pages, 2019, A4 . 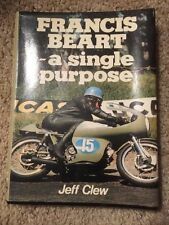 Original Approx 1960s - 70s Triumph Motorcycle Champion Spark Plug Booklet. 16 page booklet has 99.5% clean pages, good binding, Overall is in Very Good Condition. Very good condition. If you take it off the stand the motorcycle stand folds down. Off the stand the the front end turns. Made of plastic and maybe resin. Cool piece. Rare original factory literature in fair condition, worn covers and loose pages but still clean. Essential for the Triumph Motor Cycle Enthusiast, ideal for restoration and maintenance work. 3T, 3TA, 5T, 5TA, T21. The images below are illustrative only - Are not in proportion to each other and have been given a drop shadow for effect. Our stickers are fantastic value. They utilise the most up-to-date material and thermal inks available in Little Firingonone-at-Sea. Brochure,textbook on repair. Soft cover. I always combine lots. 129 pages French. 1 RARE LEMANS SPEEDY RIDES TRIUMPH MOTORCYCLE PATCH CREST . Triumph Motorcycle Cast Iron Cylinder Head. Suitable for use on 650cc Thunderbird and early Tiger 110 Models. Ready for an overhaul. Good threads. No broken Fins. B44 Victor Special. 2 X 'BSA multicolour Logo' (UK & General export version available). The images below are illustrative only - Are not in proportion to each other and have been given a drop shadow for effect. The clutch cover bolt holes were stripped out so they have been welded shut then tapped to the correct 1/4 BSW thread size. Cover sits nice and flat on the granite surface that its on for the pictures. This book is about the history of motorcycles in the world and the USSR. Also has information about scooters TULA and VYATKA. Rare edition of 1958 year! 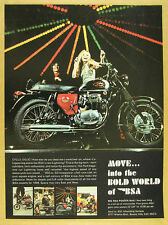 1963 2- Cycle World reprints - Triumph Bonneville Triumph Record Special. 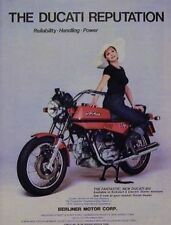 1962 2- Triumph Motorcycle Brochure ( One has in pencil - Camp out tonight under the triumph title). 1960 Triumph the best motorcycle in the world. Suitable for Single Cylinder models. The back of this card has a written biography on this bike and its importance in Motorcycle History (about 200-300 words in ENGLISH LANGUAGE). This card is 100% original - not a reprint - Printed in the USA and the facts, story and stats on the back are all in English. B34DB, B34DBD, Clubman. BSA GOLD STAR. 2 X BSA multicolour logo. The BSA Gold Star version shown below is just one of thousands available for all British motorcycles. 2 X Crest Decals. The images below are illustrative only - Are not in proportion to each other and have been given a drop shadow for effect. BSA GOLD STAR DBD34. This is the hard to find decal set that you probably need for your DBD34 Gold Star 'Catalina scrambler'. The images below are illustrative only - Are not in proportion to each other and have been given a drop shadow for effect. As new condition. Unsure of actual application. Custom Motorcycle Oil Filter. Good used condition. Classic patch in good shape. I have for sale an AMAL Price List book from Indian. (8 1/2" x 11" ). Triumph Motorcycle Exhaust Silencer/Muffler Stay. Part number E4120. NOS with very minor shelf wear.